Ukrainian opposition figure and Georgian former President Mikheil Saakashvili, center, addresses the media inside a court building in Kiev, Ukraine, Jan. 3, 2018. Ex-Georgian president Mikhail Saakashvili is vowing to fight the Georgian government if Ukrainian officials move to extradite him to Georgia in light of his conviction by a Tbilisi court Friday. The court tried and convicted Saakashvili in absentia of abusing his pardon powers while in office. Georgia’s prosecutor says Saakashvili, who was in office from 2004-2013, tried to cover up evidence in the 2006 murder of Sandro Girgvliani. The 28-year-old banker was found dead outside of Tbilisi with multiple injuries after he was seen arguing in a bar with high-ranking Interior Ministry officials. In 2008 Saakashvili pardoned four Georgian law enforcement officers convicted in Girgvliani’s murder. Georgian prosecutors claim the pardons failed to follow the procedures of a parliamentary commission on pardons and that the pardons were ultimately part of a deal to cover up evidence in an investigation of the banker’s death. In an exclusive interview with VOA’s Georgian Service, Saakashvili again denied that the 2008 pardons were part of a cover-up. Presidential pardons, the power to absolve a convict of their conviction, while common, vary by country according to constitutional statues. It is not known whether Poroshenko and his Georgian counterparts ever discussed Saakashvili’s case. Shortly after Poroshenko’s July 2017 visit to Tbilisi, however, Kyiv officials stripped Saakashvili, who was on U.S. soil at the time, of his Ukrainian citizenship. In August he flew to Poland before marching across the Ukrainian border surrounded by a throng of his political supporters who moved border guards aside and ultimately transported him to Kyiv, where he now lives as the world’s only stateless ex-president. 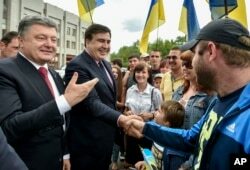 FILE - Seen during better times, Ukrainian President Petro Poroshenko, left, and then newly appointed Odesa region governor Mikheil Saakashvili, second left, shake hands with local residents, in Odesa, Ukraine, May 30, 2015. While Saakashvili’s legal turmoil has followed him from his native Georgia to his adopted home country of Ukraine, Friday’s ruling represents his first prison sentence. Ukrainian officials on Friday said they would consider Georgia’s extradition request, though legal procedures would have to be followed. But Saakashvili’s lawyer in Ukraine, Ruslan Chornolutskiy, told RFE/RL that his client’s legal status should prevent his extradition to Georgia. If extradited to Georgia, Saakashvili says he will start a “peaceful fight” to remove the government of billionaire and former prime minister of Georgia Bidzina Ivanishvili from power. “Ivanishvili is very reluctant to get me in Georgia because I am not going to sit quietly in a prison cell,” he told VOA. “For God’s sake, I am a founding father of modern Georgia. I have huge support among the populous there and also among a majority of law-enforcement and armed services. I am going to call for getting rid of Ivanishvili’s government if they extradite me there. I will do it. I am saying it openly. We will do it peacefully, but we will do it. “I am not going to allow them to execute the wish of [Russian President] Vladimir Putin by punishing me through the hands of the Georgian jail administration and law-enforcement,” he said. Since Saakashvili’s September return to Ukraine, he has led a number of anti-corruption protests against the government.